Like other integrations, you need to be an admin in order to enable the Trello integration. The Trello integration allows you to better manage your tasks. Go into your Settings and select Integrations. Click on Trello. Turn the toggle on to enable Trello. Click Save to finish enabling the Trello integration. Now, go back into your mailbox view. Next to your subject is a tag icon. Click that, and select Trello card. The first time you use Trello card, you will be required to sign in to Trello from Front using your Trello credentials. After that, complete the detail fields to create a new task. When you're done, click Create card. Your task is now be posted. You will see a tag to the right of the subject line of your email. You can click on that to see the task in Trello. Hi - We use Front to both send and receive Twilio SMS....and love it! I wanted to attach photos to some of our automated texts ... but we cant seem to get the code to work. 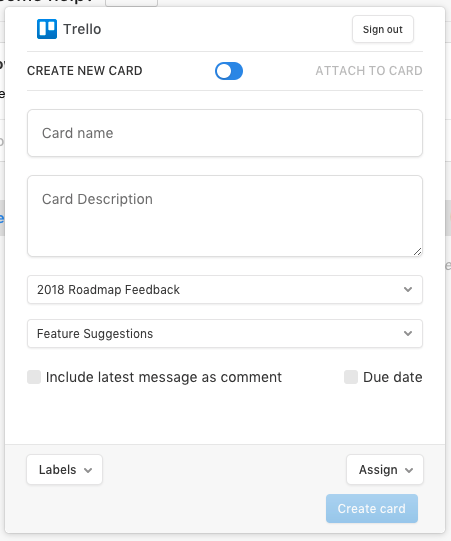 Twillio has great documentation for sending MMS direct through them, but we want to send through Front so we have a send / receive history in our inbox. Can anyone help with the code for MMS / texts with image attachments? Below is the code snippet we are trying to use. It would be great if someone from Front could help. Daniel Swift Hey Daniel, we got your message. 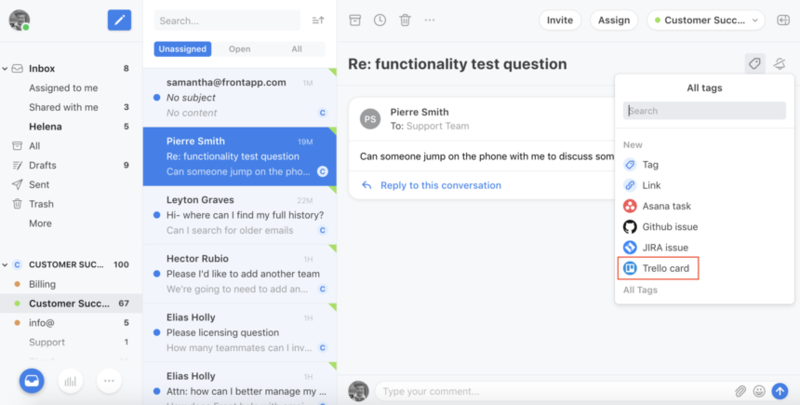 To better communicate, our technical support team will be responding to you from support@frontapp.com .